LiveU-Panasonic camera live video uplink solution. Las Vegas, April 2015: Panasonic is expanding its strategic collaboration with LiveU with the announcement of a free* firmware upgrade for its AJ-PX5000G, AJ-PX800 and AJ-PX270 series P2 HD camcorders with AVC-ULTRA recording. The upgrade will enable an integrated camera and live video uplink solution that links and leverages the LiveU Central cloud-based management platform. The PX5000G, PX800 and PX270 camcorders will now support direct connection to the LiveU Central management platform using public networks such as 4G/LTE, Wi-Fi or wired LAN. With LiveU Central and these Panasonic live cameras, any camera operator can manage a live uplink while shooting video, essential for a one-person remote crew. LiveU Central links via the camera interface, giving operators real-time indications of live transmission status and video transmission quality. Panasonic and LiveU are collaborating on an ongoing basis to expand their technical integration and business solutions to provide the best combined systems and services for worldwide customers. 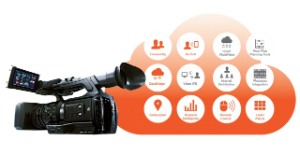 LiveU Central is a unified management platform for easy preview and remote control. The system facilitates the management of connected Panasonic camcorders and LiveU uplink units all over the world from a centralized control room, as well as the live preview of all incoming feeds, which can be routed to any LiveU server located anywhere or encoded for web streaming. The system’s LiveU MultiPoint functionality delivers internal and cross-organizational professional video distribution. The new LiveU camera solution allows PX5000G, PX800 and PX270 users to receive live streaming video from a camera in the field and output the video from a LiveU receiver to an HD-SDI video monitor while managing the camera from the LiveU Central. Live streaming to the LiveU server and Dynamic-Adaptive QoS for live streaming are supported for stable transmission. Additionally, PX270 users are able to remotely control iris, white balance and master gain of the camera via the LiveU Central. The firmware upgrade key will be available for the AJ-PX5000G in April, the AJ-PX270 in May, and the AJ-PX800 in 3Q 2015. *Camera/live video uplink requires a contract with LiveU.